I just stumbled across BPR3 (Bloggers for Peer-Reviewed Research Reporting). GREAT idea. As readers of my blog know, the majority of my posts deal with comments about published journal articles. Count me in. I'm going to try to get into the habit of using the BPR3 icon in such posts...hopefully their system will do what it says it will. Kudos to the BPR3 concept. Last week I announced the forthcoming "Beyond IQ: A Model of Academic Competence and Motivation (MACM) project post. To give a "hint" at the content and scope of this post regarding the MACM proposal, I'd like to draw readers attention to an excellent recent article by Byrnes and Miller (2007) in the journal Contemporary Educational Psychology. "As any comprehensive handbook of educational research illustrates (e.g., Alexander & Winne, 2006), the field of educational psychology is subdivided into distinct research areas such as motivation, instruction, reading achievement, math achievement, and so on. Scholars who specialize in one of these areas tend not to specialize in others. 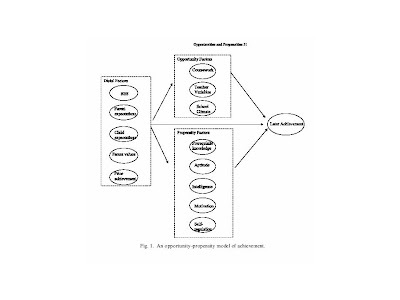 In addition, researchers within each of these areas often focus on specific components of some predictor of achievement (e.g., motivational goals) to the exclusion of other components of that same predictor (e.g., motivational attributions), and also rarely include constructs from other research areas in their studies (e.g., domain-specific skills and aptitudes). Because the problem of student achievement is so complex, it makes sense that various subgroups of researchers would try to make this problem initially more tractable by examining individual or small sets of factors in their studies of achievement. Indeed, much has been learned about these aspects of achievement in the process. However, the continued tendency to focus on a limited number of predictors within each study of achievement has led to two related problems. One is that scientists and policy makers do not have a sense of how all of the various pieces of the achievement puzzle fit together. A second problem is that the relative importance of various predictors is still largely unknown because researchers have not typically included adequate controls in their studies." (p. 599- 600). I couldn't agree more. The Byrnes and Miller model is an attempt, in the spirit of the "educational productivity" modeling work of Wahlberg and colleagues, to articulate a complete model of school learning. Propensity factors, in contrast, are any factors that relate to the ability or willingness to learn content once it has been exposed or presented in particular contexts. Thus, cognitive factors such as intelligence, aptitude, cognitive level, and pre-existing skills would qualify, as would motivational factors such as interest, self-eﬃcacy, values, and competence perceptions (Byrnes, 2003; Corno et al., 2002; Eccles, Wigﬁeld, & Schiefele, 1998; Jones & Byrnes, 2006; Sternberg, Grigorenko, & Bundy, 2001). Self-regulation is a hybrid of cognitive (e.g., beliefs) and motivational (e.g., eﬃcacy) orientations (Pintrich, 2000), so it would also qualify as a propensity factor. We further assume that when the opportunity and propensity conditions are fulﬁlled in an individual (i.e., they have been exposed to content in an eﬀective manner and were willing and able to take advantage of this learning opportunity), higher achievement will follow directly. As a result, opportunity factors and propensity factors are considered to be proximal causes of achievement. Stay tuned. I may "move up" the date of the launch of the Beyond IQ" A Model of Academic Competence and Motivation" to January 2nd. Is it possible that too much (high) fluid intelligence (Gf) can be detrimental to some forms of cognitive performance? Possibly, according to Shamosh and Gray's (2007) article "The relation between fluid intelligence and resource depletion" published in Cognition and Emotion. Although a small and select sample (the ubiquitous sample of undergraduate students), this study suggested the possibility that individuals with higher Gf may "deplete" their self-regulation resources more than individuals with lower Gf. Maybe this is why people who engage in strenuous cognitive performance over time often end up feeling drained...and in need of a break. At least this is going to give me a valid excuse when I feel I simply can't copy anymore after "thinking too hard." Abstract: Self-regulation depends on a limited resource that can be depleted temporarily, but little is known about how this resource relates to individual differences in cognitive ability. We investigated whether self-regulatory depletion would vary with individual differences in fluid intelligence (gF), a stable index of cognitive ability with ties to executive function. Participants performed an emotion regulation task varying in self-regulatory demand, followed by the Multi-Source Interference Task to assess depletion. On a separate day, participants completed Raven’s Advanced Progressive Matrices to assess gF. Emotion suppression led to impairment on the interference task, indicating self-regulatory depletion. Critically, higher gF was associated with greater depletion. Controlling for variables reflecting susceptibility to task demands and trait motivation did not influence this effect. The results have implications for theories of the relation between self-regulatory and cognitive abilities, and the mechanisms supporting the control of behaviour. There is little doubt that Howard Gardner, and his theory of multiple intelligences, has received considerable attention from the lay public and mass media. A trip to the psychology section of any Barnes and Nobles store always finds one staring at yet another book from this prolific scholar. I just skimmed Arthur "g" Jensen's review of the book (click here)--"Howard Gardner Under Fire: The Rebel Psychologist Faces His Critics)"
" Probably many educationists with little interest in acquiring a clear understanding of scientific psychology and psychometrics have uncritically embraced Gardner's psychology out of desperation. The persistent frustration of the educational system's dealing realistically with the wide range of scholastic aptitude in the nation's schools creates a fertile ground for seemingly attractive educational nostrums. Gardner's invention of the term “multiple intelligences” capitalizes on the high valuation the public accords to the word “intelligence.” The appeal of Gardner's terminology has been parodied as the Marie Antoinette theory of schooling: if the people have no bread, let them eat cake." Another post re: research on temporal processing and dyslexia over at the IQ Brain Clock blog. I've previously referenced the concept of "cognitive efficiency" in the context of the CHC Theory of Intelligence (also check here). Briefly, this construct references the interaction of cognitive processing speed (Gs) and working memory (Gsm-MW). This is IQ Byte # 2 (click here for explanation of this feature). This byte of information comes from "Anatomy of deductive reasoning" (Goel, 2007, Trends in Cognitive Sciences, 11(10)). In general I'm a positive skeptic re: most self-help books. But, as I look back on the various general-purpose non-fiction books I read this past year, I can honestly say that two self-help books have made a lasting impact on my productivity, performance, and decision-making. If you are looking for something read, check out "Getting Things Done: The Art of Stress-Free Productivity", and "Making Great Decisions in Business and Life. Not every tidbit was found useful, but, in general, I took away enough good concepts and ideas that have proven useful. Coming Jan. 7th, 2008 - Beyond IQ: A Model of Academic Competence and Motivation. This is the culmination of work I've been doing the past 5 years regarding the importance of non-cognitive (conative) variables in school learning. A hint of the focus of this new web resource can be found by reviewing prior blog posts that have touched, in bits-and-pieces, on the topic of conative variables and aptitude. The prior post re: the "Forrest Gump" report is of particular relevance to understanding this new "coming attraction." I offten find that although I may not be interested in the specific focus of a published study, a skim of the intro/review of the literature section is often informative. I frequently find nice summaries of concepts, research, definitions, ideas, etc....and I have always wanted to find a way to store them. I'm now experimenting with a pen scanner (note - I had used one 2-3 years ago but, for some reason had moved away from using it). The new scanner is a much better one than my old model, although produced by the same company (InfoScan). Click here for the model I'm using. On a recent trip I was skimming the latest issue of Intelligence and I found three interesting bytes of information in the intro section of three different articles. I scanned the information I wanted and it is produced, as is, below. The specific references are provided. Italic emphasis is by me...the blog dictator. Any URL links are also my doing. Enjoy these little bytes. I hope (but can't promise) to do this more often. Schweizer, K. (2007). Investigating the relationship of working memory tasks and fluid intelligence tests by means of the fixed-links model in considering the impurity problem. Intelligence, 35(6), 591-604. One of the oldest ideas in intelligence research is the attempt to describe intelligence in terms of speed of information processing. During the past three decades the so-called mental speed approach to human intelligence has provided evidence for a substantial relationship between psychometric intelligence and speed of information processing in elementary cognitive tasks (ECTs) which require minimal cognitive demands on the participant. The rationale of ACTS is that because these tasks are so easy they leave no room for intelligent strategic variations so that differences in performance can only be attributed to differences in the speed with which stimuli are processed and simple decisions are made. Typical ECTs include cognitive processes such as encoding or inspection time (e.g., Kranzler & Jensen, 1989), searching for information in short-term memory (Sternberg, 1969), long-term memory retrieval (Posner, Boles, Eichelman, & Taylor, 1969), and simple and choice reaction time (RT) following the rationale of flick (e.g., bensen, 1987; Roth, 1964). The question of whether working memory contributes to intelligence has stimulated a large number of studies. As consequence, many correlational results suggesting the existence of a substantial relationship are available. Ackerman, Beier and Boyle (2005) report a metaanalytic investigation of 57 studies and suggest a correlation of .48. The Inspection of the individual results reveals that this field of research shows a high degree of heterogeneity. There are rather low besides very high correlations. The results obtained by means of structural equation modeling are most impressive. Some studies even suggest near identity of working memory and intelligence with respect to individual differences. The heterogeneity of results demands for an explanation. Actually, there is a number of potential explanations. For example, the difference between correlations observed at the manifest level on hand and at the latent level on the other hand provides explanation. Different degrees of similarity between measures for the assessment of working memory on one hand and of intelligence on the other hand give rise to another explanation (Schweizcr, 2005). Samples originating from different populations, which in varying degrees allow age to act as moderator can also be accepted as explanation since age was found to be an influential source (Salthouse, 2005). Furthermore, there is the impurity of measures [Blog dictator comment - often called construct irrelevant variance] as explanation. There may different degrees of impurity. If impurity is given, one part of the observed relationship is due to the intended source of performance whereas the other part is due to another source. Impurity calls the interpretation of the result into question. Johnson, W., Mcgue, M., & Iacono, W. G. (2007). Socioeconomic status and school grades: Placing their association in broader context in a sample of biological and adoptive families. Intelligence, 35(6), 526-541. Over 20 years ago, White (1982) published a meta-analysis documenting the fact that, measured at the level the individual, the correlation between socioeconomic tabus (SES) and academic achievement is rather modest, averaging about .22. At the same time, when measured at the level of some aggregated unit of analysis such as the schoo1 or the neighborhood, the correlation is much higher, ranging as high as .80. Though SES is a variable that applies to the individual or family, its much higher aggregate than single-family correlation with academic achievement implies that people of similar SES tend to cluster together. To the extent this is true, children receive similar SES influences from both their families and their surrounding communities. If the community influences are strong, SES has the potential to be a powerful environmental variable exerting broad-based effects at a population level, despite its relatively modest effects at the level of the individual. It is probably for treason that SES continues to be so interesting to researchers investigating educational outcomes. [Blog dictator comment - see prior post where I highlighted a more current SES meta-analytic summary that updates the classic White (1982) review. As mentioned in that note, community SES is a very important variable when it comes to designing sample specifications for the standardization of cognitive tests --- but it is often overlooked. The brain blog carnival Encephalon (#38) is now available. Thanks to the ever current Mind Hacks. Learning from mistakes...or not? Check out the "dopamine effect" (and basal ganglia) post at the Mouse Trap. PsycPort has posted a news report of a new study that confirms a long held belief.....foster care is better for cognitive development that being raised in an institution. If you are interested in the concept of an internal brain clock and possible neuro-based interventions to fine-tune the clocks resolution, with the objective to improve academic functioning of school-age children, check out the today's post at the IQ Brain Clock. I just read a great article that presents an excellent framework for conceptualizing certain types of confusion that occurs during reading (Grw) and, more importantly, a conceptual framework for categorizing and describing "meta-compensation strategies"....which, IMHO, strike at the heart of self-regulated learning strategies (associated with executive functioning). Check out the article by Walczyk (2007) in the Journal of Educational Psychology. Email and the decline of civilization? Way off task for this blog...but I enjoyed this column (In the Chronical Review of Higher Education) in defense of email. The author captures much of how I feel....although I hope my emails are not as bad as the author has deliberately written this piece. Check out the ENL blog for an interesting post on "Walking and chewing gum at the same time: Multi-tasking and complex thinking"
Thanks to Mind Hacks for the tip re: a great USB brain t-shirt...just in time for XMAS shopping. 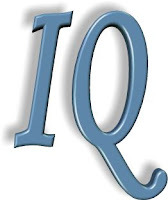 The Mouse Trap weighs in (by recommending two articles on intelligence..one my Malcom "Blink" Gladwell and the other by James "Flynn Effect" Flynn) on the importance of IQ and matters of race....a very controversial area to tread with many different opinions. These two articles are only the tip of a number of icebergs. 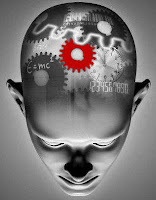 FYI - More information on the controlled executive attention model of working memory has been posted at IQ's Corner sister blog--the IQ Brain Clock. I just skimmed an interesting (an largely theoretical) article by Kail and Ferrer (2007; Child Development-click here to view) that fit different mathematical models of age-related (developmental) growth to the WJ-R (Woodcock-Johnson--Revised) Visual Matching and Cross Out tests. The article does not have immediate practical applications. I'm was interested in the article since it deals with two tests from the WJ III (conflict of interest note - I'm a coauthor of the WJ III). I also read the article because of the first author...Kail. He, IMHO, is one of the top researchers investigating the nature of developmental growth of cognitive processing speed (Gs). The authors concluded that quadratic and exponential models fit the growth patterns of the Visual Matching and Cross Out tests the bests. The quadratic model was the best fitting model. The authors use this finding to illustrate how such analysis might be useful in exploring the mechanisms that underlie growth in cognitive speed (Gs). For example, the authors note that the "parameters of these quadratics are often qualitatively like those obtained here: nonlinear change is achieved from a linear increase coupled with a nonlinear (power function) decrease." They then point other physiological/cerebral functions that show similar quadratic growth patterns - e.g., total cerebral volume and total body fat all show the same pattern of quadratic change in childhood and adolescence. The authors suggest that such a finding may suggest that all might have a "common (unspecified) biological base." Interesting stuff...but not all that practical for the field of applied intelligence testing. However, I think the finding that the two tests showed the same pattern of developmental growth might be interpreted to support the interpretation of the two Gs tests as measuring the same underlying cognitive construct. As I've written elsewhere, John Horn frequently talked about different types of validity evidence of human ability constructs--structural (factor analytic), genetic or heritability, neurocognitive, criterion-outcome, and developmental. We know from EFA/CFA (structural) studies of the WJ-R and WJ III that Visual Matching and Cross Out load on a common broad Gs factor. Logical content analysis has suggested that they are both measures of the narrow Gs ability of P (perceptual speed). The finding that both VM and CO display the same longitudinal developmental growth pattern, when combined with the extant EFA/CFA structural research that finds these two tests always loading on a common factor, in my opinion supports the validity of the logical narrow (stratum I) classifications of both tests as measures of Gs-P.
Just my two cent applied/practical extraction of information from this largely theoretical piece of research. The primary aim of the present study was to examine longitudinal models to determine the function that best describes developmental change in processing speed during childhood and adolescence. In one sample, children and adolescents (N 5503) were tested twice over an average interval of 2 years on two psychometric measures of processing speed: Visual Matching and Cross Out. In another sample, children and adolescents (N 5 277) were tested four times, every 6 months, on Cross Out. Age-related changes in performance on both tasks were examined using six longitudinal models representing different hypotheses of growth. Linear, hyperbolic, inverse regression, and transition models yielded relatively poor fit to the data; the fit of the exponential and quadratic models was substantially better. The heuristic value of these latter models is discussed.